Just a quick post to give everyone a (hopefully) last chance to leave a few more comments before the end of this blog candy. It is getting very close now so if you want to put another entry into the contest, just leave a comment on the blog. I thought I would just show another card from the Create and Craft show I am doing on Tuesday morning at 9am using the new movie and showtime stamp sets. I had a bit of fun with this card. 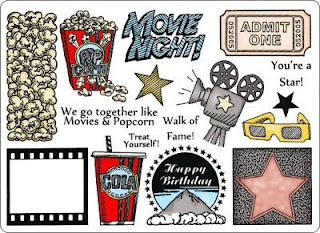 I don't do shaped cards very often, but I thought what fun it would be to do a giant popcorn container complete with 3D pieces of faux popcorn on it. You should see them in real life, they look almost good enough to eat! I have some fun demos lined up for the show, including one I'm calling faux granite that I came up with. Particraft has just released several new stamp sets this week. This sample is from the Showtime set. Aren't they fab?! I have been playing away with these as I have an upcoming show on Create and Craft using them. The show is on July 27th at 9am if you are interested in having a look. 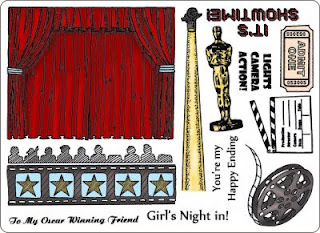 I have several fun demos planned showcasing these new stamp sets and some great products as well. If you have a scroll down you can see the stamp sets and all the great images on them. They were both designed by Sam Poole. Can't you just taste the hot buttered popcorn right now! As promised, here is a pic of the card that I made using the smooshed (spelling?) flower technique. I really like the way it came out. It has a very romantic, watercolour feel to it. If you weren't able to see the show on Thursday, I put a fresh flower and stem through my Wizard machine and this is what it produced. There is quite a bit of fluid that comes out from this technique so you want to be careful about what types of flowers you use for this. Nothing too succulent for this and also nothing too thick as it could conceivably get stuck in your machine. Have a few pieces of kitchen roll at hand to wipe down the machine and the mats when you are finished also. I hope you give it a go and let me know how you get on with it. Here are the pics of the two new stamp plates for the show on Thursday. It's a good thing I don't rely on my photography skills for a living, huh?! A little wonky, but you get the idea. The large solid floral stamp in the top left hand corner is worth the price of the multi buy alone! I could have used that one for practically every card and still not run out of ideas for it. It is truly my favourite as .....you can see below. Just to tease you a bit though, I have something planned for one of tomorrows demos that is really different. You are going to think that I have absolutely lost the plot! I am hoping it will shock (maybe a little) and delight (maybe a lot) all who watch. I'm not going to give any details (hopefully so you will have to watch!) but I will post the card after the show so you can get a good look at it. Kind of like the ribbon ruffling from a few posts back, I am hoping to have all of England doing this after they see it! Ambitious I know, but everyone needs a goal, right?! Enough said on that, but I do want to say quite a few people left comments about the paper roses. I just want to let everyone know that you can find a tutorial on the paper roses that were on my card on the last post on Maria Holder's blog. She has a lovely tutorial on her blog (so well written that I was able to learn to do them from it alone) which you can get to by clicking on it on my sidebar. It is called Imagine, Create , Inspire. While I would love to take the credit for these (as they are my favourite new addition to most of my cards), it is Maria that has come up with the idea and put it into an easy to follow tutorial form. My Biggest Blog Candy Ever!